Our beginner's guide will get you on the road to glory. 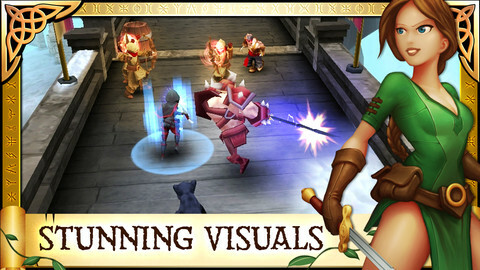 If you're new to mobile MMOs, the combat and systems of Arcane Legends may be a bit of a mystery to you. We reviewed the game earlier today, now here are all of our top hints and tips for getting the most out of this fantastic cooperative RPG. What are the differences between the three character classes in Arcane Legends? The Warrior class is most suited to those who like to get in an opponent's face and chop them to pieces with a sword. Sorcerers suit those who prefer to stand back at distance and unleash volleys of magical mayhem. The Rogue class is for the sneakier player who favors agility over brute strength. 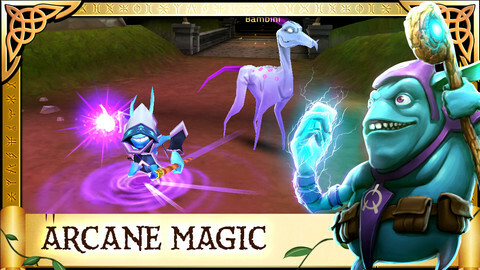 Which is the best pet in Arcane Legends? At the start of the game you'll be able to choose from one of four different pets, each of which has its own combat attributes. Timber provides a 5% bonus to damage whenever he's happy, while Precious gets a +10 bonus to Dexterity, and a 5% bonus to Dodge. Guapo the turtle gets a +10 bonus to Strength, and a 5% boost to his movement speed when happy. Note that you'll be able to acquire new pets, with their own unique bonuses as you play the game. You'll have to level them up separately, so it's a good idea to find one you're happy with and stick with it for the long-run. How can I get more character slots in Arcane Legends? You're only allowed to have one character in Arcane Legends if you're planning on playing for free. To change to a different character class, you'll either have to buy a new character slot or delete your old character. Be aware that deleted characters are gone forever! How do I equip a new weapon or piece of armor in Arcane Legends? If you get a message after a kill informing you that your pet has collected a new item, head into the inventory to see if it's something that will improve your performance. To see if the equipment is an improvement, tap on it and check out the stats on the left-hand side. If you see a lot of green numbers, that's a good sign that you should equip it! Bear in mind that each class has favored stats, so don't be afraid to lose the benefit of a secondary stat when considering your equipment. How do I equip a new title in Arcane Legends? 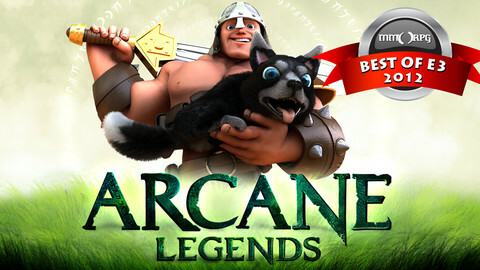 Perform particularly heroic deeds and you'll be rewarded with new titles in Arcane Legends. Head to the Avatar section of the inventory, then tap Titles. Here you'll be able to view your various accolades and set the name by which you'll be known across the length and breadth of the land! You can also view your Achievement progress under this Avatar section of the interface. How can I cause greater damage in Arcane Legends? 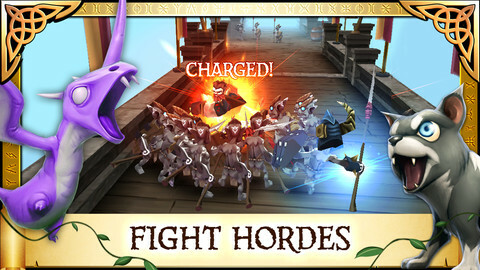 Apart from acquiring more powerful weapons, you can also use a charged attack to deliver a mightier blow. Hold down your skill button and don't release it until the meter is fully charged. This will leave you vulnerable to an enemy's attack, but it's particularly useful for Sorcerers in group play. With the enemy's attention diverted towards nearby players, you're free to unleash magical hell from a distance. How can I get more Platinum in Arcane Legends? Very occasionally, you'll receive Platinum in exchange for completing tricky quests or by leveling up. Spend this very wisely in the cash shop as it's the game's most precious resource. If you really want to get your hands on more of this currency, you'll need to hit up the in-app purchase store. Prices vary by region and quantity, so check from your device to see how much that shiny new piece of armor is going to cost you! How do I create a Guild in Arcane Legends? You've got two choices for starting a Guild in Arcane Legends, both of which are going to cost a pretty sizable amount of money. If you want to buy a charter without grinding any cash, you'll need to get hold of 20 Platinum coins. 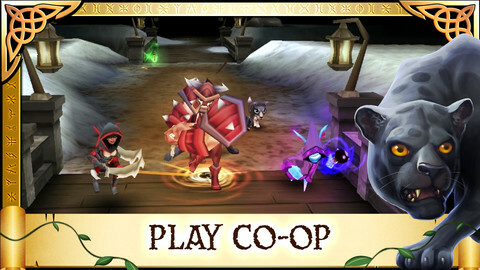 Alternatively, and this is not for the faint-hearted, you can grind out a whole 50,000 gold coins through gameplay. Once you've got the necessary cash, tap on the tab marked Social in the player profile area, then the Guild icon that's on the left-hand side of the screen. How can I communicate with other players in Arcane Legends? If you want to chat to other nearby players, tap on the speech bubble icon in the top right-hand section of the screen to bring up the virtual keyboard. Be aware that anything you type can be viewed by anyone else in the local area! You can also make a public emote by heading into the profile section of the screen and selecting Emotes. Happy? Sad? Let the world know with a custom animation.